On occasion, my "expertise" regarding sports cards is fruitful in more than one way. 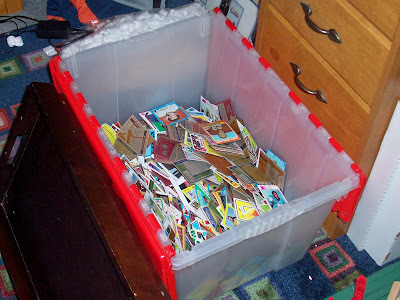 Knowing I am heavily involved in The Hobby, a co-worker about 8-9 years my senior, asked if I could help him with his childhood card collection. He has held onto it for years hoping someday his son might take interest. At this point he hasn't and wanted to free up closet space and in his words, "get what he could for them without getting ripped off by a dealer or retail shop." Not having the time or knowledge to deal with eBay I offered to sort and inventory what he had, and handle the listing, shipping etc of the cards in exchange for a percent of total sales. He brought me in a sample assortment to make sure what he had was worth the trouble. After seeing that the majority of the cards were from 1965-1975, I gladly accepted the agreement. Actually it was going through the provided "sample" and finding a VG/EX 1969 Reggie Jackson RC that I just had to know what else was there. Kids really did put cards in their bike spokes, and he was one of them. Had this collection of cards been stored properly they would be worth a lot more than what they will yield, but this is a classic win-win scenario in that he gets some cash, I get some cash, he frees up closet space, and I have a ton of material to write about. I have just begun sorting through this mess . . .
That, originated from, this mess . . .
. . . and I thought you'd like to see some of the better cards I have found so far . . . . Yes boys and girls ,that is one of (4) Reggie Jackson 1969 RC's, a 1969 Mickey Mantle, a 1967 Eddie Matthews and Robert Clemente, and a 1962 Roberto Clemente. Pretty cool eh? Stay tuned to what else I find, look for ALL of these cards, available soon, on my eBay widget in the sidebar, and for other stories related to this cool project. Wow nice stuff. I wish I had co-workers keeping buried cardboard treasures in there closet. I still remember stories from my Dad of my Grandmother throughing away his cards and his Babe Ruth!! What Babe Ruth? I wish he knew. Sounds like a 23 part series to me. That is wonderful find. 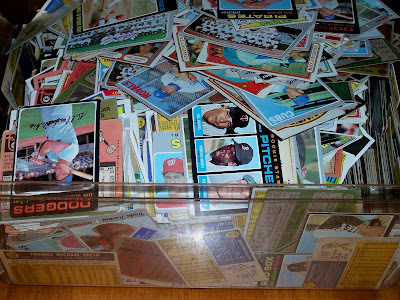 Years ago my mother-in-law picked me up a cereal box full of cards for $5 at a garage sale. 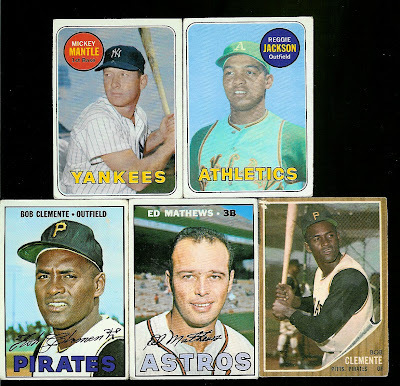 There was a '55 Topps Roberto Clemente in the mix. It was in poor shape but definitely well worth the $5 she paid. Those are quite the finds so far!! I'm interested to see what else will appear!! What will he take for the '62 Clemente? I've had hard luck winning one of those on eBay and the only one around here for sale is for BV and not in mint condition by a long shot.